Instructive, amusing, colorful—pictorial maps have been used and admired since the first medieval cartographer put pen to paper depicting mountains and trees across countries, people and objects around margins, and sea monsters in oceans. More recent generations of pictorial map artists have continued that traditional mixture of whimsy and fact, combining cartographic elements with text and images and featuring bold and arresting designs, bright and cheerful colors, and lively detail. In the United States, the art form flourished from the 1920s through the 1970s, when thousands of innovative maps were mass-produced for use as advertisements and decorative objects—the golden age of American pictorial maps. Picturing America is the first book to showcase this vivid and popular genre of maps. Geographer Stephen J. Hornsby gathers together 158 delightful pictorial jewels, most drawn from the extensive collections of the Library of Congress. In his informative introduction, Hornsby outlines the development of the cartographic form, identifies several representative artists, describes the process of creating a pictorial map, and considers the significance of the form in the history of Western cartography. Organized into six thematic sections, Picturing America covers a vast swath of the pictorial map tradition during its golden age, ranging from “Maps to Amuse” to “Maps for War.” Hornsby has unearthed the most fascinating and visually striking maps the United States has to offer: Disney cartoon maps, college campus maps, kooky state tourism ads, World War II promotional posters, and many more. This remarkable, charming volume’s glorious full­-color pictorial maps will be irresistible to any map lover or armchair traveler. "Hornsby’s Picturing America is a beautifully illustrated new book that documents the 'golden age' of pictorial maps, from the 1920s to the 1970s. It includes the playful (distorted views of the country from the perspective of New Yorkers, Texans and Californians); the obscure (a map of volunteer fire departments in Philadelphia, circa 1792, commissioned and drawn in 1938); and more of the obscure (a map of Michigan bakeries)." "An underappreciated form of American visual art: the pictorial map. They’re maps designed to draw you in and—as often as not—try to sell you something, whether it’s a tropical vacation, a brand of bourbon, or a version of the American dream. [Picturing America] highlights an occasionally twisted, often amusing, always colorful tradition of hand-drawn cartography." "Delightful, weird, informative....Picturing America collects rare images from the short-lived golden age of pictorial mapping." "Although [pictorial maps] were hugely prominent in American culture of the time, their importance has been largely overlooked. However, a new book, Picturing America, by geographer Hornsby, examines how these illustrated maps once captured the image of America." "Fifty-eight full-color, high-quality pictorial maps that amuse, instruct, and show place and region, industry, wars, and the postwar US provide a variety of perspectives to describe the country. The drawings, created primarily from the 1920s to the 1960s by US artists and mapmakers, mostly convey each designer's own world view. Hornsby assiduously collected the maps and images thematically. . . . Each map is annotated with bits of helpful information while providing temporal and spatial context. In describing the pictorial map as an American genre, Hornsby provides the contributions and biographies of notable professionals, many of whom were women, for the hundreds of maps published throughout the popular media. Recommended." "From the 1920s through the 1970s, map designers continued the tradition of mixing whimsy and fact, creating thousands of maps for use as advertisements and decorative objects. For the first time, those works of art have been bound together in a a charming volume perfect for armchair travelers." "Designed to educate, amuse, or advertise, pictorial maps were a clever and colorful component of print culture in the mid-20th century, often overlooked in studies of cartography. Picturing America celebrates these vibrant maps, tracing their development and proliferation from the 1920s to the 1970s." "It’s a lovely book, full of extraordinary maps and stories. Islands are not just geologic land forms. Thanks to this book they are living and breathing entities with long and layered histories. . . . Since this is the first publication to focus on this genre, libraries and collectors alike are encouraged to add this to their holdings. Picturing America is a nifty reference tool and readers will find of value the biographies provided of the graphic artists who made pictorial maps." "Picturing America, by Stephen J. Hornsby, is a loving exploration of the history of such maps, and is drawn from the Library of Congress’ cartography collections. . . . a worthy addition to this growing literature on creative uses of maps and examinations of the relationships between people and place." 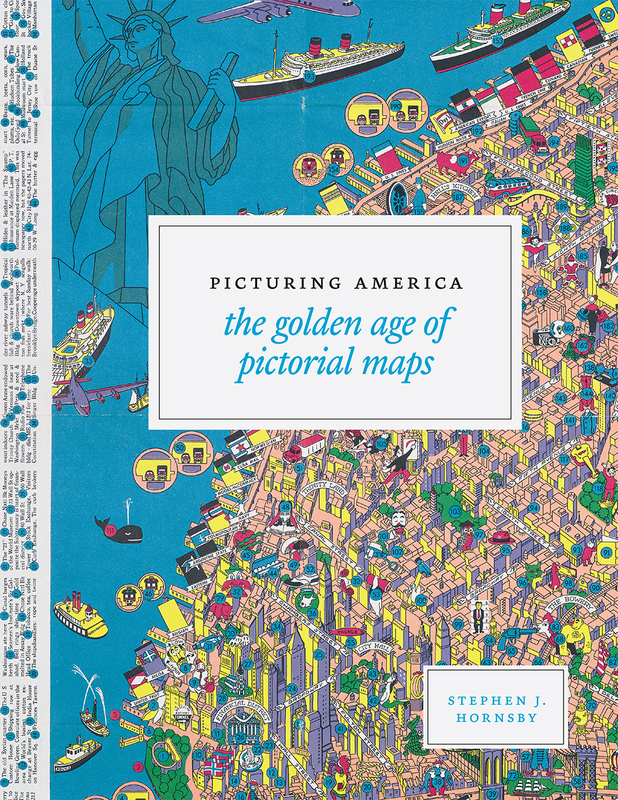 "Stephen Hornsby's Picturing America: The Golden Age of Pictorial Maps is a superbly-crafted visual feast. . . . Cartophiles and enthusiasts of twentieth-century American popular culture will relish the lavishly-reproduced color maps in the collection, more than 150 in all. Academic geographers and historians of cartography will also appreciate Hornsby's careful and thoughtful historical exegesis of a visual form that often has not been taken very seriously. The result is an enduring and endearing appreciation of pictorial maps that represents both the evolution and diversity of an especially American art form, one that has deep roots in earlier practices of visual representation and one that grew to reflect a buoyant, vibrant, and turbulent era in American popular culture."